Turkish President Recep Tayyip Erdogan says he's ready to reinstate the death penalty if the Turkish people demand it and parliament approves the necessary legislation. Erdogan spoke early Tuesday to hundreds of supporters outside his Istanbul residence who were chanting for Turkey to restore capital punishment following the failed coup. Erdogan said Turkey is "a democratic state run by rule of law" and "you cannot put aside the people's demands." European Union officials say talks on Turkey's bid to join the EU would end if Ankara restores the death penalty. "Today is there no capital punishment in America? In Russia? In China? In countries around the world? Only in European Union countries is there no capital punishment," Erdogan said. He also said he planned to meet with his National Security Council on Wednesday. The Federal Aviation Administration says it has lifted a ban on flights between the U.S. and Turkey. No U.S. carriers fly directly to Turkey. The FAA's decision mainly affects Turkish Airlines, which announced that it would resume its Istanbul-to-New York service on Tuesday. The airline also flies to several other U.S. cities from Istanbul. On Saturday, the FAA banned all flights that began in Turkey from entering the U.S. even if they stopped in another country along the way. Officials at the U.S. Embassy in Ankara had said security at Istanbul's Ataturk International Airport was "significantly diminished" after the attempted coup, and they told U.S. government employees to avoid the airport. The chairman of Turkish Airlines, Ilker Ayci, said Monday that there was no reason for the ban "as all precautions were in line with the norms." He said that following meetings, the FAA "removed the ban as expected." Turkey's United Nations ambassador says he is disappointed the Security Council could not agree on a statement regarding the attempted coup in his country. Yasar Halit Cevik said Monday that a statement from the Security Council would have been helpful when the attempted coup was still in progress. "We would have wished that the Security Council would have come to a position in a timely manner," Cevik told reporters gathered for a briefing at the Turkish Mission. The Security Council failed to condemn the coup attempt after Egypt objected on Saturday to a statement calling on all parties to respect Turkey's democratically elected government. Statements by the 15-member Security Council must be agreed upon by consensus. Cevik said what his country most needs is international support. "Turkey wants to see support, not advice or criticism," Cevik said. Turkish President Recep Tayyib Erdogan has told the U.S. cable TV station CNN that he escaped death by only a few minutes before coup plotters stormed the resort in southwest Turkey where he was vacationing last weekend. Erdogan's interview was broadcast late Monday. He told CNN that soldiers supporting the coup killed two of his bodyguards when they stormed the resort early Saturday. "Had I stayed 10, 15 additional minutes, I would have been killed or I would have been taken," he told CNN through a translator provided by the presidency. Revealing new details of the night of the coup, Erdogan said the renegade soldiers were in control of the command and control towers at Istanbul's Ataturk International Airport for hours before forces loyal to the president were able to regain control. He said that about 10,000 supporters were at the airport to greet him when his plane landed. He also said that power was shut off at all military bases, including the Incirlik air base in southern Turkey used by the U.S.-led coalition jets fighting the Islamic State group, because the military didn't want to risk having the conspirators use them. Leading global human rights groups have condemned Turkey's crackdown in the aftermath of a failed coup attempt, which has led to sweeping purges, detentions and arrests. Amnesty International warned Monday that human rights were in "grave danger." "The sheer number of arrests and suspensions since Friday is alarming," said John Dalhuisen, Amnesty's director for Europe and Central Asia. "Cracking down on dissent and threatening to bring back the death penalty are not justice." Thousands of people have been dismissed or detained in the judiciary, interior ministry, military and police following Friday's failed coup. The large scale of the crackdown has also alarmed Turkey's key allies, the United States and the European Union. Amnesty said it was investigating reports that detainees in Ankara and Istanbul had been subjected to a series of abuses, including ill-treatment in custody and being denied access to lawyers. Meanwhile, Human Rights Watch Europe and Central Asia Director Hugh Williamson noted: "The speed and scale of the arrests, including of top judges, suggests a purge rather than a process based on any evidence. Turkey's citizens who took to the streets to defend democracy deserve a response that upholds the rule of law." Turkish President Recep Tayyip Erdogan says that Turks want to reinstate the death penalty after so many terror attacks in the country. Erdogan, whose government survived a failed military coup, made the comments in an interview with CNN. Turkey abolished the death penalty in 2004 as it sought membership in the European Union. There have been renewed calls for capital punishment after the attempted coup. Turkey has also seen a spate of bombings in recent months blamed on the Islamic State group and Kurdish rebels. Turkish President Recep Tayyip Erdogan has told CNN that the foiled coup is a "clear crime of treason," adding he will approve the reinstatement of the death penalty if the parliament decides it should be restored. Turkey abolished capital punishment in 2004 as the country sought EU membership. After the failed coup attempt Friday, there were calls for reinstating the death penalty. Erdogan told CNN in an interview broadcast Monday it is up the parliament to discuss the decision. He added he would ratify it if the parliament approves. The EU called on Turkish authorities to exercise restraint after the failed coup, saying the reinstatement of the death penalty would threaten its membership bid. For the fourth night in a row, hundreds of demonstrators have taken to Turkey's squares in a new show of support for the government after a failed coup attempt. First called for by President Recep Tayyip Erdogan on the night of the coup, the "democracy meetings" have been held in all of Turkey's major cities every night for the past four nights. 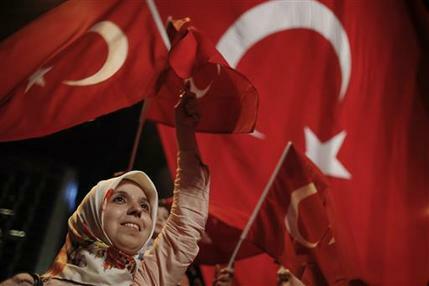 The demonstrations feature flag waving, pro-government slogans, songs praising Erdogan and Islamic chants. There is a Quran reading at the meeting in front of Erdogan's Istanbul residence in the Kisikli district. Other major demonstrations are taking place in Istanbul's central Taksim square, Ankara's central Kizilay square and Izmir's central Konak square. Iranian President Hassan Rouhani says he has spoken to his Turkish counterpart to express happiness about the restoration of stability in Turkey. The official IRNA news agency says Rouhani spoke with President Recep Tayyip Erdogan and told him: "We are happy that we have witnessed the restoring of stability in the friendly country of Turkey." Rouhani was also quoted as saying that "peace and stability in Turkey will lead to improving peace and security in entire of the region." Rouhani says Iran has closely watched developments in Turkey from Friday night. The Iranian leader described the coup attempt as a "test for detecting both domestic and foreign friends and enemies" of Turkey. He adds that Iran has "stood by and will stand by government of people of Turkey." Turkey's state-run news agency says a former Air Force commander accused of a role in a failed coup Friday night has been placed under arrest by the Ankara Chief Public Prosecutor's Office along with 25 others. The government has accused Gen. Akin Ozturk of being the ringleader of the coup, though he told prosecutors he did not plan or direct it. The Anadolu news agency, relying on prosecutors, initially said Ozturk had confessed to a role in the coup, but later retracted that report. "I don't know who planned or directed it. According to my experiences, I think that the (Gulen movement) attempted this coup. But I cannot tell who within the Armed Forces organized and carried it out. I have no information. I have fought against this structure (meaning Gulen movement)," Ozturk was quoted as saying. Before his detention, Ozturk had denied in a statement that he was involved in the uprising, insisting that he had worked to quash it. Funeral ceremonies and prayers for those killed in the failed coup attempt in Turkey were held in Istanbul on Monday. Hundreds of people gathered at the Eyup Sultan mosque for the funeral of police officer Erol Ince. The coup plotters sent warplanes firing on key government installations and tanks rolling into major cities, but the rebellion - which was not supported by the military's top brass -was quashed by loyal government forces and masses of civilians who took to the streets. A Turkish journalists' association has condemned raids and violence against media organizations and journalists both during and in the aftermath of Friday's failed coup. The coup plotters took control of state broadcaster TRT during the uprising and forced a newscaster to read a statement declaring that they had seized control. The headquarters of private CNN-Turk channel and Hurriyet newspapers were also raided. Photojournalist Mustafa Cambaz was killed while protesting the coup. The Turkish Journalists Association, or TGC, said it condemned the attempts "to eliminate parliamentary democracy, the people's basic rights and freedoms and the freedom of press or expression." The TGC also said the media had played a role in countering the coup "despite being subjected to attacks, repression and threats." The White House is urging the Turkish government to exercise restraint and act within the rule of law as it investigates and prosecutes those responsible for last week's failed coup. Press Secretary Josh Earnest said Monday that President Barack Obama would call Turkey's president soon to reiterate U.S. support for the country's democratically elected civilian government and make the case for restraint and respect for the freedoms enshrined in the Turkish constitution. Some senior Turkish officials have alleged that the coup was inspired by a Turkish cleric who lives in exile in Pennsylvania and have demanded that the U.S. turn him over. Earnest said the United States had not received any extradition request for the cleric but that it would evaluate one if it arrived under a 30-year-old extradition treaty. NATO's chief has joined with others who are calling for Turkey's leadership to respect the rule of law in its reaction to the failed attempt at a military coup. "I have spoken to President Recep Tayyip Erdogan in the aftermath of the attempted coup in Turkey," NATO Secretary-General Jens Stoltenberg said Monday in a statement. "I welcomed the strong support shown by the people and all political parties to democracy and to the democratically elected government. The Turkish people have shown great courage." As he did early on Saturday, Stoltenberg condemned the attempted coup in Turkey and reiterated his full support for Turkey's democratic institutions. "Being part of a unique community of values, it is essential for Turkey, like all other allies, to ensure full respect for democracy and its institutions, the constitutional order, the rule of law and fundamental freedoms," the NATO chief said. He called Turkey a "valued NATO ally," and offered his condolences to the families of the innocent people who lost their lives in the takeover attempt. The European Union's 28 member states are calling on Turkish authorities, including police and security forces, to exercise restraint in the wake of the failed coup. "All must be done to avoid further violence, to protect lives and to restore calm," the bloc's foreign ministers said in a statement following a meeting Monday in Brussels. "The EU calls for the full observance of Turkey's constitutional order and stresses the importance of the rule of law prevailing," the ministers said. "It is crucial to ensure full respect for all democratic institutions of the country including the elected government and the Turkish Grand National Assembly." They added that "the unequivocal rejection of the death penalty is an essential element" of the bloc's conditions for membership, the ministers added. President Recep Tayyip Erdogan has suggested that Turkey might reinstate capital punishment, which was abolished in 2004. Turkey, already a NATO member, also aspires to join the EU. The Turkish prime minister's office is canceling all public servants' leave and is asking employees currently on vacation to return to their duties. A statement from Prime Minister Binali Yildirim's office said the order, issued Monday, would be valid until further notice. The decision comes in the wake of a failed coup attempt that has killed 232 people, according to the prime minister. The government has fired thousands of judiciary and other officials suspected of links to a movement led by a U.S.-based Muslim cleric. The government says the cleric, Fethullah Gulen, is behind the failed uprising. Dogan news agency reports that an official working for Istanbul's Sisli district city hall is in critical condition after two gunmen walked into his office and shot him in the head. Deputy Mayor in charge of Development Cemil Candas has been rushed to a nearby hospital. Police detained the two gunmen, who were taken out by the rear entrance. The Sisli municipality is run by the opposition Republican People's Party, or CHP. Turkey's state-run news agency says seven prosecutors, charged with investigating a foiled coup, have entered a base in southern Turkey that is key to the U.S.-led campaign against the Islamic State group. Anadolu Agency says the prosecutors, accompanied by police, entered Incirlik Air Base on Monday. A Turkish brigadier general at the base has already been detained for his alleged role in Friday's uprising. News reports say refueling aircraft that took off from the base helped keep F-16s used by the coup-plotters up in the air. Turkey's state-run news agency says the Interior Ministry has sacked close to 9,000 personnel across the country, following Friday's foiled coup. Anadolu Agency says a total of 8,777 employees attached to the ministry were dismissed, including 30 governors, 52 civil service inspectors and 16 legal advisers. Other media reports said police and military police officers and coast guards were also removed from duty. The government has blamed the failed coup - which led to at least 232 deaths and wounded 1,400 others - on supporters of a U.S.-based Muslim cleric who has become President Recep Tayyip Erdogan's chief opponent. Germany's military says reconnaissance jets supporting the mission against the Islamic State have resumed their flights from an air base in Turkey. The military told the dpa news agency that two Tornado reconnaissance jets and a tanker flew missions Monday morning from the Incirlik air base. They were the first missions they had flown since Turkey restricted flights in the wake of a failed coup Friday night. The Bundeswehr says naval patrols it has been operating off the coast of Turkey in the Aegean as part of a NATO mission to try and stop the smuggling of refugees across to Greece were not affected by the coup attempt. Turkey's state-run news agency says a total of 103 generals and admirals have been detained for questioning across Turkey over the failed coup. Anadolu Agency says Monday that 41 of them have been ordered jailed pending trial so far. Earlier, the agency said prosecutors in Ankara were questioning 27 generals and admirals, including former Air Force commander Gen. Akin Ozturk, who has been described as the ringleader of the foiled uprising. Ozturk, who remained in active duty, has denied he was involved and insisted he worked to quell the uprising in statements he made to Turkish media. The Ankara governor's office says a military officer was detained after he shot and killed the driver of a vehicle that he hijacked. In a brief statement Monday, the governor's office said the officer - whom it described as being mentally disturbed - was caught by the security forces following a brief shootout. It was not immediately clear if the incident was related to Friday's failed coup attempt by a faction within Turkey's military. Earlier, news reports said police detained a man in front of the courthouse in Ankara after a series of shots were fired. Turkey's prime minister has rejected accusations that his government is concentrating all efforts on dealing with the aftermath of a failed coup, weakening its ability to counter foreign or terrorist threats. Binali Yildirim told reporters at the end of a cabinet meeting that Turkey is "strong enough to eliminate multiple threats at the same time." Yildirim said: "Turkey is a great country with 100 years of experience." The Turkish premier also insisted that Friday's failed coup had no major economic impact. "Our banks, our bourses are working. Our central bank is on top of its duties. Any changes in economic indices are normal and no different from fluctuations recorded on normal days." Turkish Prime Minister Binali Yildirim says a total of 232 individuals were killed during a failed coup attempt. Speaking on Monday, he said the toll comprises "208 martyrs" - in reference to government supporters - and 24 coup plotters. With a cracked voice and tears, he repeated a question his grandson had put to him: "Why are they killing people?" Earlier, government and military officials had put the fatalities in the anti-government camp at 104. The prime minister did not explain the discrepancy. He said the pro-government dead were 145 civilians, 60 police officers and three soldiers. The prime minister also said 50 coup backers and 1,491 government supporters were wounded in the unrest. He put the total numbers of detentions since Friday's tumultuous night at 7,543, including 6,030 military. Germany says negotiations for Turkey to join the European Union would end if the Turkish government decides to revive the death penalty following a failed coup. Chancellor Angela Merkel's spokesman Steffen Seibert told reporters in Berlin Monday that the EU is a "community of values, therefore the institution of the death penalty can only mean that such a country could not be a member." For the moment, he says that Germany and other EU countries are watching the internal Turkish debate on whether to institute the death penalty, but that the EU's position is clear. "We categorically reject the death penalty and an institution of the death penalty would mean an end to the negotiations to join the EU," he said. The European Union and United States say Turkey must respect democracy and human rights in its response to a failed coup. EU foreign policy chief Federica Mogherini says rule of law must prevail in Turkey at a time the government is rounding up suspects. She said Washington and Brussels agree on the need for Turkey to respect democracy, human rights and fundamental freedoms. Mogherini spoke Monday at a joint news conference with U.S. Secretary of State John Kerry, after Kerry met the bloc's 28 foreign ministers. The European Union commissioner negotiating with Turkey on its accession bid believes the Turkish government is exploiting the failed coup to target internal opponents. Johannes Hahn said Monday it appears Turkey's government "prepared" arrest lists before the weekend coup attempt and had been waiting for the right moment. Hahn said of the government's post-coup response: "It is exactly what we feared." He spoke before a meeting of EU foreign ministers in Brussels. Turkey has detained some 6,000 people. They include hundreds of judges and prosecutors, and more than two dozen generals. Turkey's state-run news agency says the Interior Ministry has sacked close to 9,000 personnel across the country, following Friday's foiled coup attempt. Anadolu Agency says a total of 8,777 employees attached to the ministry were dismissed, including 30 governors, 52 civil service inspectors and 16 legal advisers. Other media reports said police and military police officers and coast guards were also removed from duty. The government has blamed the failed coup - which led to at least 294 deaths and wounded 1,400 others - on supporters of a U.S.-based Muslim cleric who has become President Recep Tayyip Erdogan's chief opponent. Turkey's state-run news agency says prosecutors have begun questioning 27 generals and admirals over the failed coup attempt. The Anadolu Agency says Monday the group questioned by prosecutors in Ankara includes former Air Force commander Gen. Akin Ozturk, who has been described as the ringleader of the foiled uprising. Eight Turkish military personnel who landed in Greece in a helicopter during a military coup in Turkey are to appear in court in the northern Greek city of Alexandroupolis, charged with illegally entering the country. They are likely to request a one- or two-day postponement during Monday's court appearance. Turkey is seeking their return, and all eight have requested asylum in Greece. The eight landed in Alexandroupolis Saturday after issuing a distress call and requesting permission for an emergency landing. Their lawyer, Vassiliki Ilia Marinaki, has said her clients say they knew nothing about the coup and that the helicopter had been used to transport wounded. They say that shortly after finding out about the coup, they came under fire from the police and feared for their lives. Saudi-owned broadcaster Al-Arabiya says Saudi authorities detained Turkey's military attache to Kuwait while he was at the airport in the eastern Saudi city of Dammam. Quoting unnamed sources, the Dubai-based broadcaster said Monday that the attache, Mikail Ihsanoglu, was on his way to Düsseldorf, Germany via Amsterdam when he was detained. The official Saudi Press Agency meanwhile reported that Saudi King Salman, who is vacationing in Morocco, called Turkish President Recep Tayyip Erdogan to "congratulate him on Turkey's return to normality" after an attempted military coup. The European Union's foreign policy chief says foreign ministers on Monday will send a "strong message" that the rule of law and the democratic system of checks and balances must be respected in Turkey following the failure of a military putsch. Federica Mogherini, the EU's high representative for foreign affairs, spoke before a meeting of the bloc's foreign affairs ministers in Brussels. The ministers will also be meeting for breakfast with U.S. Secretary of State John Kerry. Belgian Foreign Minister Didier Reynders says Turkish authorities' reaction to the failed coup needs to be "proportionate." He says he was alarmed by the arrests of judges and calls for reinstatement of the death penalty against coup participants. Warplanes have patrolled Turkey's skies following a failed coup, a sign that authorities fear the threat against the government is not yet over. 0 Response to "AP LATEST NEWS: ERDOGAN READY TO REINSTATE DEATH PENALTY"